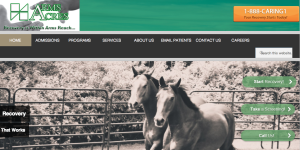 Ember Networks is excited to release a new website for Arms Acres Treatment Facility. Arms Acres is a rehabilitation and recovery center located in the beautiful community of Carmel, NY, 60 miles north of New York City. The website reinforces Arms Acres commitment to providing digital communication and technology for current, prospective, and post patients. Ember built the new Arms Acres website focusing on an alluring and pleasurable user experience. We combined a streamlined navigation system, compelling graphics and layout, and intuitive site architecture. Ember Networks increased communication usability through intuitive and interactive site forms, and making the admissions process an easier experience for the user. Mobile Responsive Design – As more people interact with the web on mobile devices its imperative for new websites to provide an efficient and pleasurable mobile experience. A mobile responsive design responds to the device on which the website is being accessed. The website will change layout and content for mobile phones, tablets, and desktops. Funnel Optimized Architecture – The Arms Acres website is built to introduce and convert prospective patients into the treatment facility system. We’ve built a navigation path designed for the user to easily access facility information and make first (even anonymous) contact. This conversion funnel drives users from the home page or a dedicated landing page to an admissions / intake specialist. Online Employment Application – Ember developed an extensive seven page interactive employment application form. Additionally, the new website takes advantage of the latest tech including HTML5, CSS3, social media sharing, and media integration (including high definition video). Arms Acres enhanced website, built by Ember Networks, showcases the invaluable work undertaken by the rehabilitation and psychiatric treatment community. Moving forward, the Arms Acres website will be a beneficial tool for the recovery community and employees, featuring extensive tools and resources. Arms Acres is owned and operated by Liberty Behavioral Management Corporation. Liberty provides high quality, cost effective inpatient and outpatient treatment care throughout the tri-state Metropolitan area. Included in Liberty’s treatment programs are inpatient detox, adult / adolescent / child programs, and a variety of rehab services.